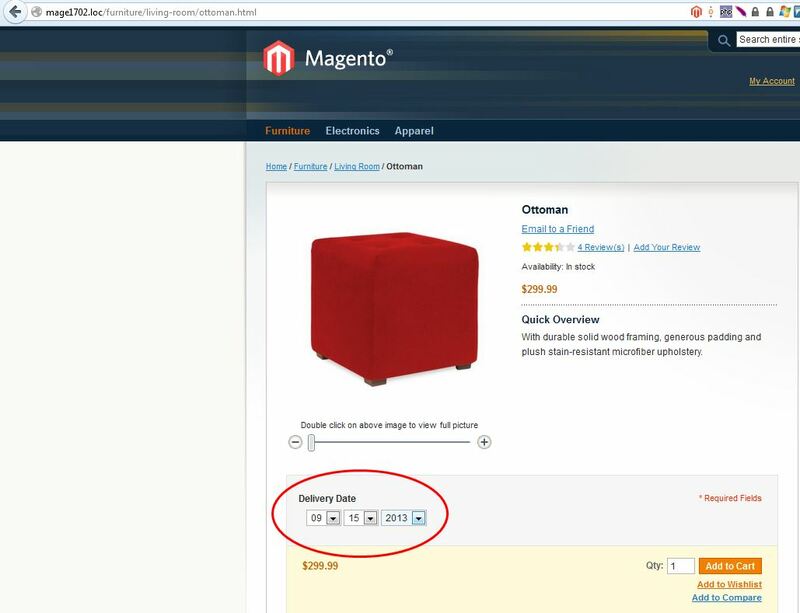 This post is actually short tutorial on how to create custom option for product and how to extend Magento Sale Order grid to show custom option as “Delivery Date”. This is beginner guide tutorial so if you’re new to Magento you’ll find it useful. At the end it will be fully functional Magento Module. Imagine that you’ve gotten requirement that goes something like: “We would like to create custom option for each product in our Magento store, “Delivery Date“, so that our customers can set desired delivery date on every order. We are selling one product per order so setting custom option on each product would be enough for us. Further, our Operations Team needs additional information inside the Magento Sales grid. Requirement is to add a special sales grid within Magento back-end. New grid should be same as default Magento Sale grid with additional column “Delivery Date” that will be used by our Operations Team”. This requirement could be one of your next tasks, feel free to modify it or even use it as-is (whole module). If you’re not familiar with Magento’s product custom option please refer to next link. And you’re all set. Simple as that – now you have for specified product custom product option that can be used by customers on your store. 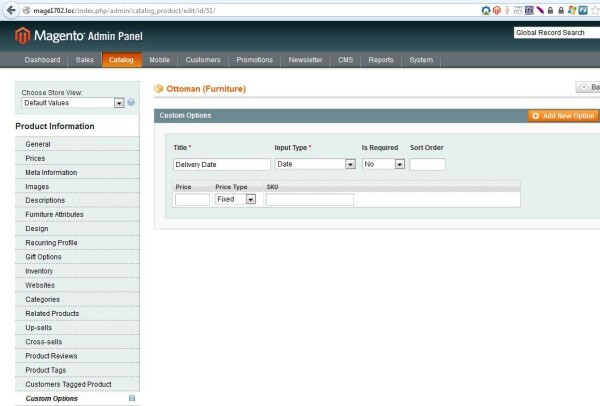 Now lets see how we can create grid for our custom option, similar to Magento’s Sales Order grid with our new data, Delivery Date. So lets start with creating our module. Note that I’ve commented “translate” node under “adminhtml” XML node. If you have some sentences that needs to be translated on other languages feel free to un-comment those lines and add missing sentences. 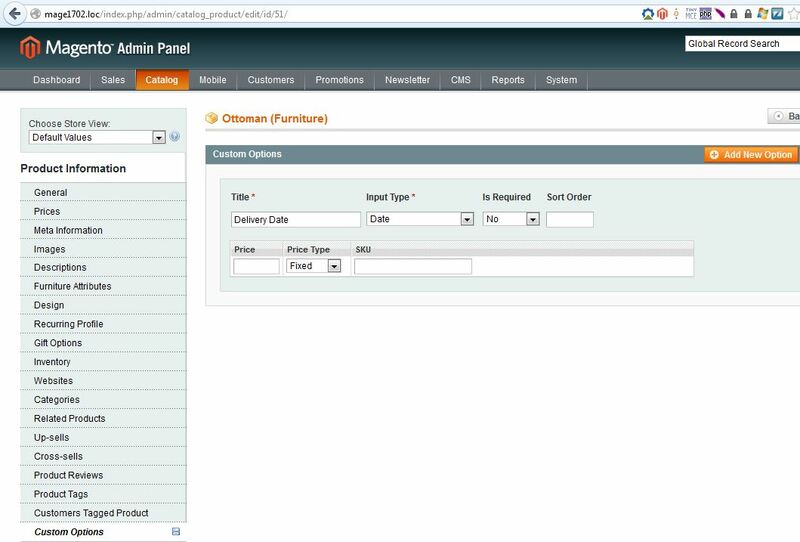 Now all you need to do is to add Operations menu item to your administrator role (sign out/sign in – if needed) and you can use your new grid in Magento back-end. Note that when customers add some custom options for product, data will be saved in table sales_flat_order_item, in column product_options. Additionally, as data in table sales_flat_order_item is serialized its a bit complicated for this tutorial to show you how you can filter & sort by “Delivery Date” and because of that sorting and filtering by it has been disabled. How can I add Custom Options to Multiple Products instead on Single one? Or if you are interested in more advanced features, I can suggest you checking out this magento 2 custom options plugin. Hi, that’s nice but what if I need a link inside my custom attributes? I tried to add a checkbox with a link inside its label but the label shows the link as plain text instead of showing the formatted link. How can I have links in custom attributes? When i am clicking on operations tab its getting blank can you please help me? I would also like to have this delivery date in the subject of the new order email sent to customers for any new purchase. How can we achieve this? Hi, I know my question is not exactly related to this subject but there is any extension to use (or ever been build) in order to filter after product custom options (not attribute) or somebody tried this? I have over 20k simple products in one of my websites…and using configurable products is not a option (I have products that have more then 10 options each – meaning 10 simple products). Thanks! Looks like a great tutorial, but I don’t want to follow it through if it’s not going to do what I need it to. Thanks! i am developing Shirt selling website and i need the custom button for the size and colour to be displayed in below the name of the product and about the qty. please guide me . Thank you a lot, this code is working fine. I have a question,is there any way to edit date field from admin panel? Did you resolve your issue? If there’s anything that should be noted here?. Other people might have similar issue so it would be great to leave some note. I just installed new Magento v1702 with sample data and I followed all steps and I can see grid. Try to set in index.php ini_set(“display_errors”, true) & error_reporting(E_ALL ~ E_NOTICE). Also you can enable developer mode so you can see errors on screen. Everything should work correctly. Please re-check all files and see if you have any typo or similar (you might created some file with different capitalization and/or wrong filename). And I don’t see any error messages.. Under reports –> sales there is no operations only orders and others… I’m able to view those reports..
Everything is actually fine but when I click on sales –> Operations I don’t get to see the grid, I get menus and all with a blank area..
Can you please see under reports what is the error message? Did you set proper file permissions? I am able to see the Operations menu under Sales.. But when I click on that I’m getting a blank screen.. I’m not able to see the grid.. I tried log out/log in but it’s still not working.. I followed everything, but it’s not working for me.. Nothing is being displayed when I click Sales –> Operations..
Nice and good idea to add delivery date on orders. If order contain more than products then its create problem in Sales department to understand , why not display in Order View Page per Item Wise.